Apple subsidiary Beats on Friday uploaded a short 30-second spot to its Twitter account featuring two of its animated "Pill" creatures and the Siri virtual assistant, marking the first collaborative ad effort since Apple bought the audio company in May. It is unknown if the clip will be aired on television, or if it is meant to stay Web-exclusive, but the ad is the first overtly collaborative video spot to see release since Apple first announced its $3 billion Beats acquisition. 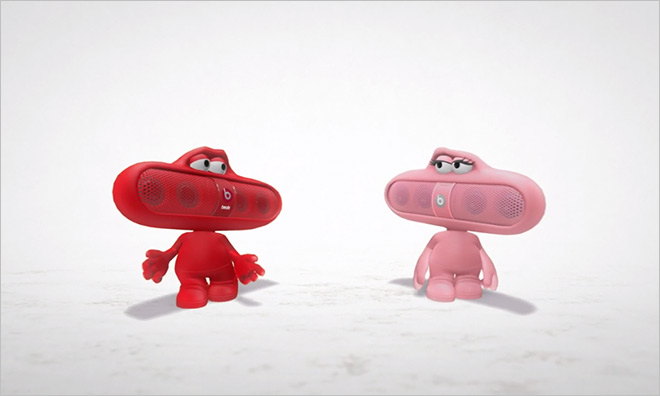 In the spot, two characters based on Beats by Dre's Pill speakers, named Mikey and Tina, talk up the recently closed deal, saying, "It's official, Apple and Beats have joined forces." Mikey suggests they celebrate the news. A disembodied Siri, creepily listening in on the conversation from the ether, says she heard Dr. Dre might be throwing a party to commemorate the partnership, perhaps a tongue-in-cheek reference to the rap star's premature announcement celebration that was caught on tape in May. The trio goes on to discuss how the party is an invitation-only affair and the Pills are aren't on the guest list. After some dry banter, Mikey asks Siri to let him in on the party's secret location, but the virtual assistant is disinclined to reveal that information. "Sorry, I didn't get that," Siri says. The oddly scripted spot is Beats' first video ad to be released in partnership with Apple.